I have a 2003 Chevy Avalanche 1500. My factory amp under my center console I believe is going out because sometimes when we get in the truck the radio plays audio & others it does not. Everything comes on as it should, just does not play any sound. We could be driving & all of a sudden it comes on. I have unhooked all my wires at least 3 times & re hooked them up just to make sure I have not had any loose wires or bad connections. So I want to do a temp fix until I can replace the factory amp. I want to bypass the amp & hook the speakers straight up to each other from the amp wiring harness. I would unhook the 2 wiring harnesses on the amp & then run a jumper wire from each speaker to make it like the amp never there. I want to run it this way instead of running all new wires to each door. If anyone can help me with this project that would be great. Hi guys, Does anyone have the Bose amp (like the one on a 2015 Yukon SLT) harnesses wiring diagrams. Specifically for the speakers. Cheers. *I can't get the pictures to load for some reason but you can message or text for them* This totally plug n play interface works with all 2014-2018 Silverado, Sierra, Tahoe, Denali etc with Bose or non amplified systems to add aftermarket amplifiers while retaining factory functions however be aware it will NOT work with the 7" iob oddball I have! Full specs/compatibility here... https://navtv.com/products/NTV-KIT838/m650-gm.html $750.00 shipped anywhere in the states and message for others. Many references here, google "Mr Marv Tacoma" for my online reputation and you can always call me at 831-383-0308. I have the bose audio system in my 2018 All Terrain. I have the XM Radio trial and I have my subscription to Spotify. After about 2 month of ownership I've realized that the XM Radio has significant better quality in sound than using apps from my phone by bluetooth, or apple play. I have adjusted some settings within those apps to play the highest quality yet it doesn't translate as well as the XM Radio. Each time I switch between the two. I have to crank up the volume for spotify and crank it back down when on XM. Anyone else experience that? Any resolution? I just traded in my 2012 2500 crew cab (Chevy LTZ) for a 2016 3500 crew cab (Denali) and have noticed a huge difference in the sound of the stock stereo. They are both Bose premium systems but they sound worlds apart. I have seen other posts on 2016 Yukons and Tahoes that the new ones are hollow, but have not seen comments on the 2016 trucks. Not to knock the truck as everything else has exceeded my expectations except this, but for an MSRP of almost 70K, I think a vehicle should have a decent stereo. 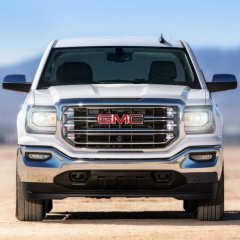 I even tried to reach out to GM to see what size speakers where in the truck: JC:7:02:52 PM GMC - Assistance with my Infotainment system Connection established. Welcome to GMC Connecting.....A live chat agent is now entering the chat. A:7:03:12 PM Hello and welcome to GMC Infotainment Customer Support! How may I help you today? JC:7:04:14 PM Hi A, I just purchased a 2016 3500HD crew cab Denali and have a few questions about the speaker system. Would you be able to help with this? A:7:06:56 PM Congratulations on your new purchase! We don't assist with speakers. To better assist you I am going to transfer you to our Customer Assistance Team who can better answer this question. would you like me to transfer now or do you have any questions regarding the infotainment system-IntelliLink? JC:7:07:38 PM No, please transfer me. Thank you. A:7:08:25 PM Ok. Please hold one moment while I transfer you. Thank you. Agent Tyler enters the call Agent Antonio left the call T:7:10:50 PM Thank you for contacting GMC Customer Assistance, My name is Tyler how can I assist you today? JC:7:11:17 PM Hi T, I just purchased a 2016 3500HD crew cab Denali and have a few questions about the speaker system. Would you be able to help with this? T:7:12:09 PM What kind of questions do you have for the speaker system in the car? JC:7:12:46 PM This is 2 parts:I have a Bose 7 speaker syste JC:7:13:29 PM The first is what size speakers are in the dash, front doors, and rear doors? JC:7:15:48 PM The second is it seems I have no sub, which I believe is supposed to be speaker 7. I just traded in a 2012 with a bose and the sub was in the console.....Is that the same for my 2016? T:7:17:16 PM Unfortunately we don't have technical information. I recommend contacting a dealership, they would have more information about the size of the speakers. Please allow me 2 to 3 minutes to see if the sub woofer is included. JC:7:18:44 PM No problem on the delay. I want to confirm whether or not it's included. Thank you. T:7:20:56 PM Thanks for waiting, I'm sorry but I don't have any information on the Bose Package. I recommend asking the dealership this question also. Sorry for any inconvience. J:7:21:57 PM Thank you T, I appreciate your time. .....am I being unreasonable thinking this is not right? Installed Sub & Amp to 6 speaker BOSE (no console/no stock sub). LC2i - Issues with signal interference...Bass dropping in and out. Bose Earns GM’s Supplier of The Year Award - What Makes Bose Special? John Goreham Contributing Writer, GM-Trucks.com 4-26-2018 Framingham Massachusetts-based Bose has earned the 2018 General Motors Supplier of the Year Award. The award was presented during GM’s 26th annual supplier recognition day in Orlando, Florida this week. “This is an opportunity for General Motors to honor those suppliers who are truly the best of the best,” said Steve Kiefer, GM vice president, Global Purchasing and Supply Chain. “The automotive industry is transforming at an incredible rate. The relationships we have with our supply base means everything when it comes to delivering a strong vehicle lineup today and the cutting-edge vehicles and mobility services of tomorrow.” During the event, GM took time to recognize 132 of its top suppliers from 17 countries. GM’s awards for best supplier go to companies that consistently exceeded GM’s expectations, created outstanding value, or bring new technological innovations to the company. Bose has now earned the top spot in five of the 26 years the award has been presented. “We have a team of highly dedicated people who support our global work with General Motors, and they make sure our systems consistently exceed expectations,” said Ken Johnson, global director for Bose Automotive’s GM business. “This award is a testament to that commitment and we are incredibly honored by the recognition.” The privately help Bose company was founded by MIT Professor, Dr. Amar G. Bose, in 1964. However, it wasn’t until the early 1980s that Bose began to provide premium audio to automakers. Dr. Bose approached GM with a surprising proposal; That he and his company could make premium audio for cars that sounded better than the best home systems. Bose pioneered tuning audio systems to specific models, a practice that is now commonplace. Coincidentally, Bose is headquartered and does much of its manufacturing and research close to GM-Truck’s members’ homes. We have a number of neighbors proud to work at the company, which has a reputation for hiring the best minds in the region. Bose is considered by many to be one of the best places to work in the Northeast. I just replaced my alternator on my 2006 Sierra 1500 today, after doing so my radio only plays sound out of the subwoofer. I checked the radio and amplifier fuses and they were good. Any help would be greatly appreciated! I am trying to add an AudioControl Line Output converter, and 2 separate amplifiers to my existing 2015 Sierra Crew Cab SLT Bose system. I'll use a 5-way amp to power the front, rear, and console subwoofer. I've got a sub amp to power dual 10" subwoofers in an enclosure under the back seat. I've looked everywhere for a 2014-2015 GMC Sierra aftermarket harness for Bose systems without any luck. Basically, I would like to fabricate a custom harness so that I don't have to totally splice into the existing wiring. That way, I can simply keep my existing bose system in place, and if needed for warranty or if I end up selling or needing to yank out the audio system, still keep factory in place. Also, I can't completely remove the factory Bose amp, because it handles other processing, like bluetooth, door chimes, etc. The amp will continue to power the two dash speakers, and have other low level inputs from the factory head unit, but all of the other speakers outputs (from Bose Amp) will be summed by the AudioControl LOC, then output via RCA to the two amps, with speaker level outputs from the amps back to the custom harness and out to the speakers. I've found an adapter from Metra for an amp bypass (http://www.metraonline.com/part/70-2057), which was made for non-bose, but will work for the female side of the custom harness on the bose system, but I need the male versions of the adapter as well to connect to the amp. If I could get the harnesses identified as #3 in the photo below, I think that will work. Then I just do all the splicing and electrical connections on the custom harness instead of factory wiring. Any idea how to find/order it? I want to install the PSS-31GM alpine system. It is listed as not compatible with Bose. So I'm thinking BS. it can be done. I just need the signal to each speaker to a Audio control crossover then RCA out to amp. Is the Bose a 4 channel or a 6 channel? <--matters for the crossover I need the wire out diagram. I may upgrade the rear door speakers to alpine X 6.5 , as the low end speakers don't look up to par. Yes I now there is a 10" Alpine restyle dash available. But it offers 2-3 more features and the lose of a few factory options. So at this time not interested. I was going to do a custom fiberglass box with amp. but at $1200 for the equipment alone and that is just low end bass. it makes the Alpine a steal! Replacing Bose factory 6.5" subwoofer in the center consol with a JL audio 6w3v3. I have seen many people talk about doing this but have never actually seen anyone follow through. I also replaced my rear door speakers. Factory size is 4x6 and I put in 6x8. Made tempelate of speaker size and traced onto the truck door with sharpie. Then used tin snips to cut out the hole. It was super easy and there is nothing back there to get in the way. Then made a mounting ring out of MDF and a jig saw. Painted it black and put a foam sealer on it which pulled tight when I mounted the speaker. I did notice a better sound quality when I added the 6x8 over the 4x6. I swapped because I lost sound out of my back right speaker and thought why not throw a bigger speaker in there. I will be installing the JL 6w3v3 with the JL jx250 amp this week and I will post pictures and let anyone know how it turned out. Obviously it's not a 10 or 12 under the rear seat but I think it will add a much better sound overall. Not looking to wake the neighborhood. I have read many places it's is "sooo complicated" to get to the Bose sub in the center consol why bother with it. Not true at all. It took 25-30 min to get the entire console out and pull the sub. How to get Full range signal to front door; 7 speaker Bose? I have a 15 Sierra Denali. I recently changed the front and back door speakers to infinity kappa coaxials. I found out the rears are getting a full range signal from the Bose amp and the fronts are filtered along with the dash. Is there any way to get full range to my front doors without an external amp? I will also Change the dash to infinity 3.5 2ways. I'm installing a line out covertor for an amp in my 2016 Silverado WT. it does not have the BOSE system. I need to know what color the speaker wires are behind the radio and which plug they are on. I have looked every where for a diagram but I can not find one. Hey yall, I am new to this forum so I am not exactly sure where to put this at... i have read and read on this topic and I just cannot make sense of anything. I have a 2005 gmc 1500 with factory bose system and on star with steering controls. I did the xm auxiliary mod and has kept me tied over for the last 2 months but I am getting tired of the system. I am wanting to install a double din that is compatible with my android phone. I am wanting to completely ditch the bose system and install a amp for the speakers and then have a separate amp for the sub. I have read that the chimes go through the bose amp, so what I can't understand is can i ditch the amp but somehow retain the factory interface. I am aware there are adapters and wiring kits buto I just see arguments over which one to get. What can I do to hopefully keep everything working? Any help is greataydon appreciated! Sorry if I missed the posts where this was talked about! Have a blessed night yall! I have an LTZ Z71 with the LTZ plus package and the Bose speakers with the bucket seats and center console. It says that I am supposed to have a subwoofer and I had read it talked about in the center console but I do not see it. Where is it and how do I tell it's there and working? If someone has a pic that would be great. I'm planning on adding component speakers and aftermarket amplification to my 2015 Bose System with Subwoofer. I've seen several posts stating that the chimes were extremely loud after amplification. I know that the head unit controls don't adequately lower the volume. Has anyone successfully bypassed or attenuated the chimes yet? I read that theoretically you could tap into the post-Bose amp rear speaker signal and then split you your components and sub signals from this. The chimes apparently go through the front left speaker. Would this allow you to still use bluetooth for phone, etc, and is this the best option? Any ideas?